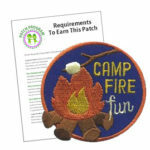 Make the “Campfire” Patch from MakingFriends®.com a symbol that your group has participated in learning the rules of a safe and fun campfire outing. S’mores, songs and skits around the campfire are all traditions. 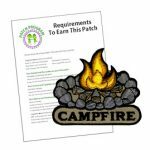 With this patch from MakingFriends®.com your girls will remember the fun times they had around the campfire! Do your part for the environment. Don’t use paper goods at your camp out. 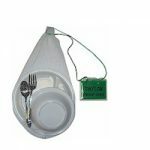 Use a dunk bag to save water when cleaning your dishes and utensils. Stitch up a dunk bag using re purposed craft supplies. Works well with an 8″ plate. It’s easy and fun. No scissors or glue needed. Make one on your first day of camp or ahead of time at a meeting. Cord colors will be assorted colors.